So when I think of all the gaming-related things I would do if I had greater amounts of burnable money, one of the things I would love to do (besides owning more games) would be to hit Essen every year in October. 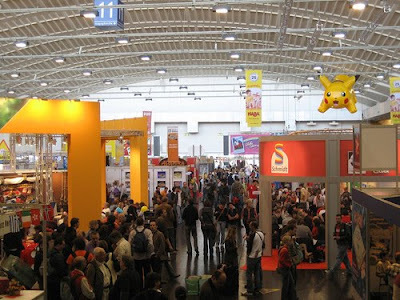 As I have mentioned before, Germany has been the cradle of modern boardgaming for the last 30 or so years and every Fall in Essen they have an enormous gaming convention. And it is simply referred to as Spiel (Game). Most publishers and designers around the world releasing games in the last half of the year try and wait until the 3rd quarter Essen event. This year its from Oct. 22nd to Oct. 25th and will probably garner around 150,000 visitors. Games released this year include Funckenschlag - Fabrikmanager by the guy who made Power Grid, Assyria from Ystari Games, a new Alea game called Macao, and of course Dominion: Seaside. Sigh... Some people want adventure vacations, some people want tropical vacations, I want a gaming vacation. oh ho ho, this place is going on "the list"! !